The trees swallowed her brother whole, and Jenny was there to see it. Now seventeen, she revisits the woods where Tom was taken, resolving to say good-bye at last. Instead, she's lured into the trees, where she finds strange and dangerous creatures who seem to consider her the threat. Among them is Jack, mercurial and magnetic, with secrets of his own. Determined to find her brother, with or without Jack's help, Jenny struggles to navigate a faerie world where stunning beauty masks some of the most treacherous evils, and she's faced with a choice between salvation or sacrifice--and not just her own. 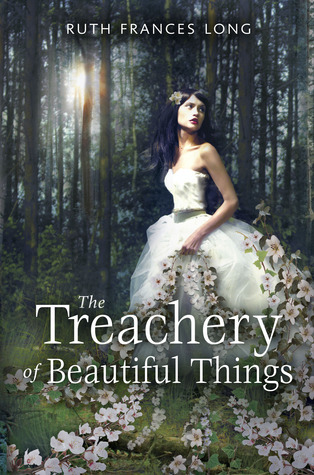 The Cover: If you didn't know this already- The Treachery of Beautiful Things has a very similar cover to The Hedgewitch Queen (Sarah will be reviewing that book soon). Although it always disappoints me when one of the Big 6 Publishers uses stock photos that have been used before- I appreciate the fact that they changed the picture enough that it looks different. I love the flowers that they put all over the cover, and I love that it ties in with the storyline somewhat. It is a very beautiful cover, but I just wish it wasn't a stock picture. The Characters: I wasn't really a fan of Jenny's character in the beginning. She felt a little superficial and a little too wide eyed and innocent. I have to say, though, that I thought the author developed the main character incredibly well. I loved Jack and the mystery surrounding him. And can I say how awesome it is for the hero of the book to not be some brooding bad boy? Seriously awesome. Jenny and Jack's development together felt naturally paced and believable (well as believable as fae can be). I loved Titania's character in this book, and I loved the conflict that Tom went through. The characters in this book really stood out and made me care about what happened. The Story: This book was like a piece of triple chocolate poundcake- you know the kind with the little chocolate shavings. You stare at the cake and take one little piece and suddenly you find yourself in front of a platter covered in crumbs and you feel satisfied and a little guilty? That is this book. The story starts off in the past, telling the story of how Jenny's big brother Tom was swallowed by the trees. Jenny has been a little off ever since- not crazy, but when you go through a trauma like that, you can't help but be affected. Jenny makes her way into the forest after hearing Tom's music (he is a flute player). She becomes hopelessly lost and finds herself in grave danger. The fae are completely intermingled in this story- and this is a fae book that uses Oberon and Titania, rather than a fae kingdom created by the author (however, there is a great deal created by the author- but alas, that is spoilerish!) I appreciate that the author doesn't explain things. It is helpful for the reader to at least know who Titania and Oberon are, and have a basic understanding of fae kingdoms. As someone who has read many fae books, I appreciated not having a page of "explaining" about all of this to skip through. This is hands down one of the best fae books I have read. This book absolutely reads like a fairy tale. It has adventure, passion, and a satisfying ending- no major cliffhangers here (thank goodness!) I loved the classic-ness of this tale. It was wonderful reading this book and experiencing the same feelings I had when I read Beauty and the Beast or Sleeping Beauty for the first time. The book has magic and shares that magic and wonder with the reader. I loved all the twists and turns in this story- every time I thought I had predicted the next scene I was wrong! The characters are brave and fight for what they believe in. All in all, this was a fabulous book and I hope that you put it on your "to read" list. Ruth Long is an author to watch- and personally I can't wait to read more! I've been on the fence about this book for a while now, but your descriptions have swung me towards reading it. I really need more fairy tale stories in my life!